Offer not valid in Puerto Rico. Lease financing available on new 2019 BMW 330i xDrive Sedan models from participating BMW Centers through BMW Financial Services through April 30, 2019, to eligible, qualified customers with excellent credit history who meet BMW Financial Services' credit requirements. Monthly lease payments of $469 per month for 36 months is based on an adjusted capitalized cost of $40,147 (MSRP of $45,945, including destination and handling fee of $995, less $3,000 customer down, $0 security deposit and suggested dealer contribution of $798 and $1,000 Lease Credit, $1,000 Loyalty/ Conquest Certificate). Actual MSRP may vary. Dealer contribution may vary and could affect your actual lease payment. Cash due at signing includes $3,000 down payment, $469 first month's payment, $925 acquisition fee and $0 security deposit. Lessee responsible for insurance during the lease term, excess wear and tear as defined in the lease contract, $0.25/mile over 30,000 miles and a disposition fee of $350 at lease end. Not all customers will qualify for security deposit waiver. Tax, title, license, registration and dealer fees are additional fees due at signing. Advertised payment does not include applicable taxes. Purchase option at lease end, excluding tax, title and government fees, is $27,567. Offer valid through April 30, 2019 and may be combined with other offers unless otherwise stated. Models pictured may be shown with metallic paint and/or additional accessories. See dealer for details. Offer not valid in Puerto Rico. 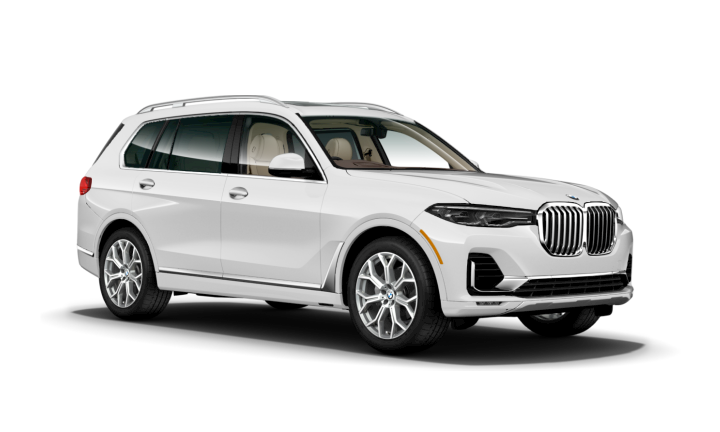 Lease financing available on new 2019 BMW X7 xDrive40i models from participating BMW Centers through BMW Financial Services through April 30, 2019, to eligible, qualified customers with excellent credit history who meet BMW Financial Services' credit requirements. Monthly lease payments of $959 per month for 36 months is based on an adjusted capitalized cost of $73,976 (MSRP of $78,595, including destination and handling fee of $995, less $4,500 customer down, $0 security deposit and suggested dealer contribution of $119). Actual MSRP may vary. Dealer contribution may vary and could affect your actual lease payment. Cash due at signing includes $4,500 down payment, $959 first month's payment, $925 acquisition fee and $0 security deposit. Lessee responsible for insurance during the lease term, excess wear and tear as defined in the lease contract, $0.30/mile over 22,500 miles and a disposition fee of $350 at lease end. Not all customers will qualify for security deposit waiver. Tax, title, license, registration and dealer fees are additional fees due at signing. Advertised payment does not include applicable taxes. Purchase option at lease end, excluding tax, title and government fees, is $47,157. Offer valid through April 30, 2019 and may be combined with other offers unless otherwise stated. Models pictured may be shown with metallic paint and/or additional accessories. See dealer for details. Offer not valid in Puerto Rico. Lease financing available on new 2018 BMW X2 xDrive28i models from participating BMW Centers through BMW Financial Services through April 30, 2019, to eligible, qualified customers with excellent credit history who meet BMW Financial Services' credit requirements. Monthly lease payments of $269 per month for 36 months is based on an adjusted capitalized cost of $30,565 (MSRP of $41,295, including destination and handling fee of $995, less $3,000 customer down, $0 security deposit and suggested dealer contribution of $2,230 and $4,750 Lease Credit, $750 Loyalty/ Conquest Certificate). Actual MSRP may vary. Dealer contribution may vary and could affect your actual lease payment. Cash due at signing includes $3,000 down payment, $269 first month's payment, $925 acquisition fee and $0 security deposit. Lessee responsible for insurance during the lease term, excess wear and tear as defined in the lease contract, $0.25/mile over 30,000 miles and a disposition fee of $350 at lease end. Not all customers will qualify for security deposit waiver. Tax, title, license, registration and dealer fees are additional fees due at signing. Advertised payment does not include applicable taxes. Purchase option at lease end, excluding tax, title and government fees, is $24,364. Offer valid through April 30, 2019 and may be combined with other offers unless otherwise stated. Models pictured may be shown with metallic paint and/or additional accessories. See dealer for details. Offer not valid in Puerto Rico. Lease financing available on new 2018 BMW X1 xDrive28i models from participating BMW Centers through BMW Financial Services through April 30, 2019, to eligible, qualified customers with excellent credit history who meet BMW Financial Services' credit requirements. Monthly lease payments of $319 per month for 36 months is based on an adjusted capitalized cost of $31,541 (MSRP of $39,945, including destination and handling fee of $995, less $3,000 customer down, $0 security deposit and suggested dealer contribution of $1,404 and $3,250 Lease Credit, $750 Loyalty/ Conquest Certificate). Actual MSRP may vary. Dealer contribution may vary and could affect your actual lease payment. Cash due at signing includes $3,000 down payment, $319 first month's payment, $925 acquisition fee and $0 security deposit. Lessee responsible for insurance during the lease term, excess wear and tear as defined in the lease contract, $0.25/mile over 30,000 miles and a disposition fee of $350 at lease end. Not all customers will qualify for security deposit waiver. Tax, title, license, registration and dealer fees are additional fees due at signing. Advertised payment does not include applicable taxes. Purchase option at lease end, excluding tax, title and government fees, is $23,568. Offer valid through April 30, 2019 and may be combined with other offers unless otherwise stated. Models pictured may be shown with metallic paint and/or additional accessories. See dealer for details. Offer not valid in Puerto Rico. Lease financing available on new 2019 BMW 430i xDrive Coupe models from participating BMW Centers through BMW Financial Services through April 30, 2019, to eligible, qualified customers with excellent credit history who meet BMW Financial Services' credit requirements. Monthly lease payments of $529 per month for 36 months is based on an adjusted capitalized cost of $42,976 (MSRP of $49,945, including destination and handling fee of $995, less $3,000 customer down, $0 security deposit and suggested dealer contribution of $1,719 and $2,250 Lease Credit). Actual MSRP may vary. Dealer contribution may vary and could affect your actual lease payment. Cash due at signing includes $3,000 down payment, $529 first month's payment, $925 acquisition fee and $0 security deposit. Lessee responsible for insurance during the lease term, excess wear and tear as defined in the lease contract, $0.25/mile over 30,000 miles and a disposition fee of $350 at lease end. Not all customers will qualify for security deposit waiver. Tax, title, license, registration and dealer fees are additional fees due at signing. Advertised payment does not include applicable taxes. Purchase option at lease end, excluding tax, title and government fees, is $28,469. Offer valid through April 30, 2019 and may be combined with other offers unless otherwise stated. Models pictured may be shown with metallic paint and/or additional accessories. See dealer for details. Offer not valid in Puerto Rico. Lease financing available on new 2019 BMW 740i xDrive Sedan models from participating BMW Centers through BMW Financial Services through April 30, 2019, to eligible, qualified customers with excellent credit history who meet BMW Financial Services' credit requirements. Monthly lease payments of $839 per month for 36 months is based on an adjusted capitalized cost of $72,415 (MSRP of $89,345, including destination and handling fee of $995, less $5,500 customer down, $0 security deposit and suggested dealer contribution of $10,430 and $1,000 Loyalty/ Conquest Certificate). Actual MSRP may vary. Dealer contribution may vary and could affect your actual lease payment. Cash due at signing includes $5,500 down payment, $839 first month's payment, $925 acquisition fee and $0 security deposit. Lessee responsible for insurance during the lease term, excess wear and tear as defined in the lease contract, $0.30/mile over 22,500 miles and a disposition fee of $350 at lease end. Not all customers will qualify for security deposit waiver. Tax, title, license, registration and dealer fees are additional fees due at signing. Advertised payment does not include applicable taxes. Purchase option at lease end, excluding tax, title and government fees, is $50,033. Offer valid through April 30, 2019 and may be combined with other offers unless otherwise stated. Models pictured may be shown with metallic paint and/or additional accessories. See dealer for details. Offer not valid in Puerto Rico. Lease financing available on new 2019 BMW X5 xDrive40i models from participating BMW Centers through BMW Financial Services through April 30, 2019, to eligible, qualified customers with excellent credit history who meet BMW Financial Services' credit requirements. Monthly lease payments of $739 per month for 36 months is based on an adjusted capitalized cost of $57,927 (MSRP of $63,395, including destination and handling fee of $995, less $3,500 customer down, $0 security deposit and suggested dealer contribution of $1,218 and $750 Loyalty/ Conquest Certificate). Actual MSRP may vary. Dealer contribution may vary and could affect your actual lease payment. Cash due at signing includes $3,500 down payment, $739 first month's payment, $925 acquisition fee and $0 security deposit. Lessee responsible for insurance during the lease term, excess wear and tear as defined in the lease contract, $0.25/mile over 30,000 miles and a disposition fee of $350 at lease end. Not all customers will qualify for security deposit waiver. Tax, title, license, registration and dealer fees are additional fees due at signing. Advertised payment does not include applicable taxes. Purchase option at lease end, excluding tax, title and government fees, is $37,403. Offer valid through April 30, 2019 and may be combined with other offers unless otherwise stated. Models pictured may be shown with metallic paint and/or additional accessories. See dealer for details. Offer not valid in Puerto Rico. Lease financing available on new 2019 BMW M4 Coupe models from participating BMW Centers through BMW Financial Services through April 30, 2019, to eligible, qualified customers with excellent credit history who meet BMW Financial Services' credit requirements. Monthly lease payments of $899 per month for 36 months is based on an adjusted capitalized cost of $66,931 (MSRP of $72,795, including destination and handling fee of $995, less $3,000 customer down, $0 security deposit and suggested dealer contribution of $614 and $2,250 Lease Credit). Actual MSRP may vary. Dealer contribution may vary and could affect your actual lease payment. Cash due at signing includes $3,000 down payment, $899 first month's payment, $925 acquisition fee and $0 security deposit. Lessee responsible for insurance during the lease term, excess wear and tear as defined in the lease contract, $0.30/mile over 30,000 miles and a disposition fee of $350 at lease end. Not all customers will qualify for security deposit waiver. Tax, title, license, registration and dealer fees are additional fees due at signing. Advertised payment does not include applicable taxes. Purchase option at lease end, excluding tax, title and government fees, is $41,493. Offer valid through April 30, 2019 and may be combined with other offers unless otherwise stated. Models pictured may be shown with metallic paint and/or additional accessories. See dealer for details.